March 28, Professor Paulo Ferrao, the president of the Foundation for Science and Technology Portugal (FCT), led his group to visit the Institutes of Science and Development, Chinese Academy of Sciences (CASISD). They were welcomed by Professor Jiaofeng Pan who is the president of CASISD, and relevant CASISD personnel. The representatives from FTC and CASISD signed the memorandum of bilateral cooperation after the symposium. Currently, Portugal is working with the United States, Canada, the United Kingdom, South Africa and some other countries to establish the Atlantic International Research (AIR) Center in Azores islands (Portugal), where Professor Ferro also serves as the president. After indicating the aim of this visit, Ferro introduced the progresses of AIR and the willingness for the future cooperation with China. The FCT hopes to be able to conduct in-depth collaboration with the Chinese Academy of Sciences in the fields of oceans, space and energy, and make full use of the CASISD stage and its advantages of strategic research. The foundation and prospect of cooperation was confirmed by Professor Jiaofeng Pan. Futhermore, the joint research center under construction and recent communication of research activities was also discussed in the symposium. 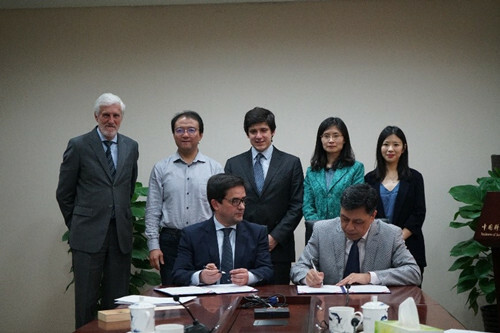 In order to achieve a deep and comprehensive cooperation, both Jiaofeng Pan and Paulo Ferrao signed on the memorandum of cooperation and made an agreement under the memo framework, which includes building the joint research center together and carrying out joint research on the fields of prospective science and technology, innovation policies, sustainable development and so on, especially focusing on the strategy and policy research on oceans, space, climate change, energy and other related fields. Various forms of cooperation are adopted, such as mutual visits, joint training, undertaking scientific research projects together and co-organize important international activities, so as to improve the establishment of the international think tank networks based on the both platforms of FCT and CASISD. FTC is responsible for the science and research funding in Portugal, training scholarships and the assessment of national laboratories. It is the duty of FTC to promote, support, guide and evaluate the plans and projects of science and technology institutes, and to conduct talent training and identification of qualified experts. Professor António Sarmento who is the coordinator of Construction Committee of AIR Center, Francisco Cunha who is the chief operating officer (COO) in satellites and applications area at the TEKEVER group, and relevant personnel from the department of international cooperation and exchange and the department of the major task management integration also attended the symposium.